You know what’s good? Besides bacon? 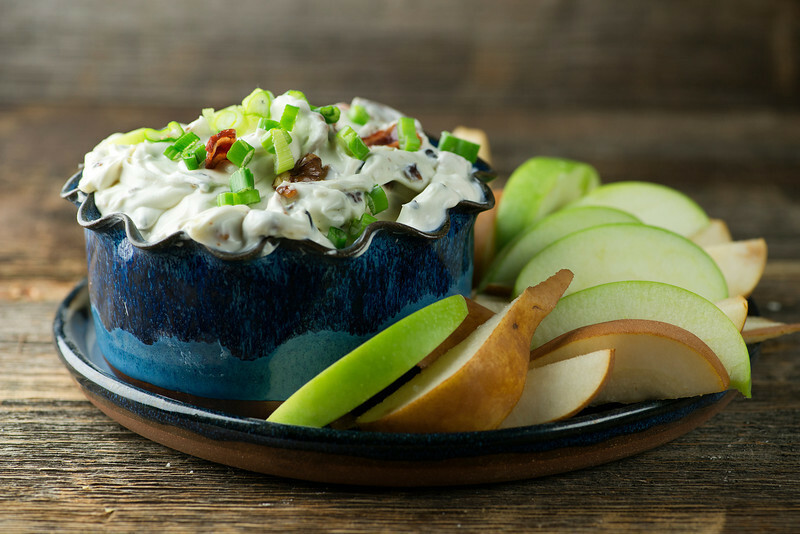 Bacon mixed up with blue cheese and cream cheese and a few other goodies into a creamy, dreamy dip. And you know what’s even better? Serving it up not with the usual chips and crackers and celery sticks, but with juicy slices of apple and pear. It’s that whole sweet meets salty meets crunchy meets creamy thing that will make you forget all about dinner because you are so perfectly happy with the before-dinner nibbles. As dips go, this one is pretty much as easy as it gets. You do have to cook up some bacon beforehand first, although that is never too much of a hardship for me. Seeing how it has to be sampled and all, just for quality assurance purposes. After the bacon is cooked and is safely resting on a paper towel, give a handful of chopped walnuts a quick sauté in the bacon drippings and set them aside too. Now toss some cream cheese and blue cheese in a bowl and beat it with an electric mixer until it is all mixed up and wonderful. Drizzle in just enough half and half to make it dippable. Now stir in the bacon and the walnut, put it in a pretty bowl and sprinkle some chopped scallions on top. Surround it with some slices of green apple and pear, and let folks dig in. And if by some miracle you have any leftover…spreading this on the top of a hot baked potato or a juicy steak will pretty much make your life complete. Cook bacon in a skillet until crisp, and then remove with a slotted spoon and drain on paper towels. Leave the drippings in the skillet. Add the walnuts to the skillet and cook over medium heat until toasted, about 1-2 minutes. Remove to paper towels with the bacon. Put the cream cheese and blue cheese in a bowl and whip with an electric mixer until well-combined. Add half and half in small portions until the dip is the right consistency – you may not need all of it. Stir in the bacon and the walnuts, and transfer to a pretty bowl. Scatter scallions over the top. Serve with apple and pear slices. doesn’t this just sound delightful?! will have to put in in the rotation for appetizers!